The movie stars Bruce Willis and Ben Affleck. 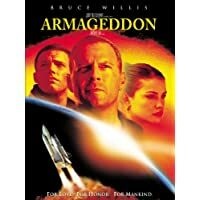 The theme: a roughneck deep core drilling crew accustomed to drilling deep into the earth's core for oil, is selected to travel into outer space to destroy a Texas-sized asteroid hurling its way through space on a collision course with Earth. All of the earth's nuclear arsenal together can not knock the asteroid off its cataclysmic rendezvous with Earth. But the same asteroid can be destroyed by an explosion from 800 feet below its surface. Enter Harry Stamper and his roughneck crew. These chosen men were almost certain to never see their loved ones again. The world that they would save, if successful, would be enjoyed by others -- not them. With less than an 18-day life expectancy for the planet Earth, why not stay and enjoy it to the last, mend fences with men and God, and prepare to die? There could only be one answer. They loved far too much not to go. The theme of the movie is wrapped-up in the line from Harry Stamper to his daughter explaining why he decided to go, "I just don't trust anybody else to do it. That's all." This line is perfect! It says better than I ever could, or as well as has ever been explained to me, why God would send His only begotten son to save the world--He could trust the job to no one less than Himself. God had originally created mankind to walk in total fellowship with Him, to be a part of Him. But man was separated from God by the sin of Adam. With that separation came all the toil and troubles commonly associated with our present sojourn in this land. Adam's transgression of His law required a penalty. The penalty by its very nature would prevent God from accomplishing his original purpose in man -- to walk in total fellowship with Him. Would God's desire then be thwarted by His own law? No! God had a plan to redeem mankind. He would have someone stand in the stead of man and bear his burdens for eternity. But who was worthy of such a call? A condemned man could hardly stand for another condemned man. For even if he could satisfy the debts of the other, having done so he would have no one to stand for him. One who would undertake to stand for all mankind would have to be blameless, one whose purity exceeded the aggregate sin of the world. There was only one -- the only begotten son of God. Yes, His own son would pay the price so that you and I might again fellowship with God. His only son would die; and by his death untold others would inherit the riches of the Kingdom that was His. And it would not be a peaceful death or a simple separation from the Father God. The death would be on the Cross -- slow, agonizing, and public. The separation, which to Jesus was the greater part of death, would be from the only One on whom he could depend. In His last moments He would ask "...why hast thou forsaken me?" He would hang in that place created by the sin of man, where we should all have individually gone -- a place of constant torture -- a forsaken place. A punishment too horrible for man to bear was heaped upon our Savior and multiplied by the number of each sinner who would have the opportunity to come to the Father. Unlimited eternities of unbearable agonies, garnered together and borne by one -- a debt paid. There is a reason this movie went to video so soon after release. So if you have not seen it, don't suffer through it for the sake of this review. See it with this new insight, and know that the real story contained in Harry Stamper's statement to his a daughter, "I just don't trust anybody else to do it. That's all," is found in John 3: 16, For God loved the world so much that he gave his only Son so that anyone who believes in him shall not perish but have eternal life.